It’s Lovely, But What’s in it for my Dog? Dog parks are a top amenity on the ideal lifestyle list for many dog families. A quick scroll through your Instagram or Facebook feed will prove that 21st century dogs are officially in the limelight, right where they belong. Many who are looking to relocate consider an area or community as much for the sake of their dog(s) as they do for themselves. Dog-friendly hiking or walking trails – check. Dog-friendly beaches – check. Leash-free dog parks? More and more checks guaranteed. As people become aware of the benefits of having a pet, they’re also coming to the realization that, in essence, “pets are people too”. Roaming outdoors, getting plenty of exercise and staying social are all as important to a dog’s health as they are to our own. Master-planned communities across the country are heeding the healthier living calls of canines and their humans by creating spaces for dogs and their owners to mingle with other dogs…and their owners. Keowee Key, a lake community just outside of Clemson, SC in the foothills of the Blue Ridge Mountains is full of parks. But, its latest addition may be one of the busiest. Residents are thrilled to have a place where they can plan doggie dates or schedule daily or weekly visits to so that dogs can play off-leash both on and off the “agility equipment” with new and old canine companions. Owners can also sign up for dog training sessions held at the park. At Lakewood Ranch, the three acres of fenced-in, leash-free space at the Paw Park is every dog’s preferred stomping ground. Also a resident favorite, the Paw Park is a popular spot for neighbors to mingle. A doggie drinking fountain, a separate small dog and puppy area, benches and a bag dispenser are on site. The folks at Hampton Lake in Blufton, SC are convinced that pet companionship can be vital to health and well being at all ages. So, they went all out for resident canines and their families. Sand pits, earth mounds, and grass fields allow dogs to do more than just stretch their legs. And, the six ft. fire hydrant and handheld shower is a hit with dog owners not so fond of mud-covered paws. The picnic shelter with tables and benches is a great space for neighbors to become friends and for good friends to spend time together. 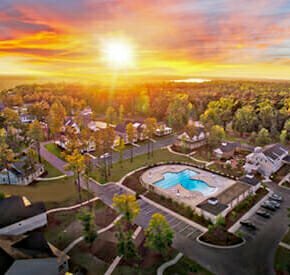 The Villages at Citrus Hills on The Nature’s Coast in Florida has decided to integrate two and four-legged exercise spaces. At Rockwood Park, you can play basketball, bocce ball, run with your dog(s) on the fitness trail, or let them run free at the Rockwood dog park. Aside from the standard dog park amenities, bone-shaped sand traps and water-play features like the spraying fire hydrant keep dogs digging and diving, providing the ultimate in doggie aerobics. At St. James Plantation near Southport, NC dogs are everywhere – hanging their heads out of golf carts, running with their owners, and paddling alongside swimmers in the surf. But running leash-free, socializing and relaxing at one of St. James two dog parks – Woodlands Park and St. James Drive Park – are dog and owner favorites. If access to a restroom is essential, then Woodlands Park is your best bet. Master-planned communities are integrating parks and ample spaces for dogs to roam because a dog’s life is the good life. And, given the benefits of having them in our lives, communities and their residents want to do whatever they can to make a dog’s life even better. On Callawassie Island, active living unfolds in classic Lowcountry style. What better way to truly experience the lifestyle and community of Callawassie Island than to visit? Drive across our private, 1/4-mile causeway, and leave the hectic world behind as you enter paradise. Through our Discovery Visit, you’ll enjoy on island accommodations with unlimited access to our state-of-the-art Fitness Center, six Har-Tru tennis courts, 27 holes of Tom Fazio designed championship golf courses and magnificent dining at our Callawassie Island Clubhouse. Callawassie Island is the epitome of Lowcountry living. Book your Discovery Visit today, and enjoy an island experience like no other. Our website provides a comprehensive list of all HOMES that are currently for sale. Click HERE to begin viewing properties. HOMESITES on Callawassie Island are made available simply by clicking HERE. This will direct you to a list of all properties. Tampa, FL — Minto Communities USA President Mike Belmont announces that Minto was presented with eight 2019 Eliant Homebuyers’ Choice Awards at Eliant’s 23rd annual awards banquet held in Newport Beach, California. Homebuyers’ Choice Awards are presented each year to homebuilders judged by their own homebuyers to have provided the best customer experience. Winning homebuilders are selected based on results from 125,000 surveys administered by Eliant to all recent homeowners of more than 150 major homebuilders throughout the U.S.
Minto’s Customer Excellence Manager Sabina Schleicher received the top individual honor — the Eliant Customer Experience Leader of the Year award. Design Representative Angela Rinaldi with Minto’s The Isles of Collier Preserve community in Naples, Florida received a First Place Design Representative of the Year award. Allan Cumston with Minto’s Latitude Margaritaville Daytona Beach received a Third Place Construction Representative of the Year award, and Diana Richard with Minto’s Westlake community received an honorable mention. In the High Volume Builders category, Minto received a Second Place Design Experience award, Second Place First Year Quality award, and honorable mention in the First Year Customer Service award category. In the Single Division Builders category, Minto won Third Place Overall Purchase and Ownership award. Eliant has long been recognized as the nation’s leading provider of customer experience management services for U.S., Canadian, and Middle East building firms. The firm’s customer experience monitoring, training and consulting services are considered to be the industry gold standard. Minto has received consistently high rankings from Eliant Customer Service Surveys. For information on Minto Communities, visit www.mintousa.com. Follow Minto on Facebook and Instagram at MintoCommunitiesUSA and on Twitter @MintoCommUSA. Farms are rarely spotted on planned community amenities lists, but when they are, they change the game completely. River Bluffs, just outside of Wilmington, NC, is anything but a typical planned community. While many developments begin with clear-cutting, and acquiring as much property as possible to account for expansion, River Bluffs has meticulously built 100 homes in and around at least one third of the hardwoods that originally covered the Bluff’s 300 acres, 40 feet above the Cape Fear River. The land was acquired in 2006, and River Bluffs has since become an ideal model for conscious and slow, preservation-based development. And, the development of the farm and market was as methodical and meticulous as every other aspect of this development. But, it would appear that the fourth time is the charm. Stephan Douglass, a fifth generation farmer and owner of Turner Farms, is the fourth farmer to cultivate nearly three acres just across the bridge from River Bluffs. Douglass, his son Ian, and Ian’s girlfriend, Jessica Allison, work on the farm daily. Turner Family Farms leases the land at River Bluffs in order to grow closer to town. Additional crops are grown at the Family Farm in Teachey. All produce grown at River Bluffs is used to fill CSA (Community Supported Agriculture) boxes, tables at the weekly River Bluffs Farmers Market, and in the kitchen at Porches Café with Chef Erin Wiley. And, it’s the method to Douglass’ agricultural madness that makes all of this possible. “It’s an intensive crop rotation divided into 100×100 plots,” Douglass said. “Our goal is to farm as sustainably and organically as possible, and to have something producing year round.” And, indeed they do. While there are 20 sectioned garden plots on the back acre for residents to tend, community garden-style, a farming signup and schedule are in the works as well to afford residents more opportunities to get their hands dirty and be a part of what is produced here. Because, Lennon said, who doesn’t want to live in a place surrounded by trees, on the water, with all necessary amenities, and have access to a working, sustainable farm that produces the contents of a nifty little box delivered to their doorstep every week? His guess would be, not too many.